The aim of the SEW Trust is to improve the earning potential and circumstances of women in South Africa, by providing training which enables them to find employment within the beauty industry. This is the journey of a woman. A journey walked with purpose and perseverance along the road to success. It’s about thinking big and achieving wide; it’s the beautiful prospect of something better, something bolder, something with soul. Sorbet Empowering Women (SEW) proudly supports women in pursuit of their dreams. SEW aims to improve the career goals and earning potential, living circumstances and financial independence of historically disadvantaged women in South Africa. We do this by providing sponsored skills development that enables unemployed women to enter the beauty industry. Anelisa Mgadeni – a SEW graduate.“Women must support one another. Try to give other women your hand so you can get that hand back and help where you can.” This is the philosophy of Anelisa, a graduate of the SEW Academy who has been employed at Sorbet Sea Point for a year as a nail technician. When she first heard about SEW, she was working as a cashier at Woolworths and her friend, knowing her passion for the beauty industry, shared the opportunity with her. Anelisa believes that beauty is not something you can just wake up and decide to do. You must be passionate about it, something that grows within you. In high school, her mother wanted her to be a pilot but Anelisa had other plans. “When I was in grade 11, I started doing hair and makeup for clients on weekends and noticed there was a steady flow of people interested in the service.” She realised that she had a talent and wanted to attend school to learn more. It was then that she approached the SEW Academy as financial constraints prevented her from attending beauty school. A keen and dedicated student, Anelisa thrived at the SEW Academy, always giving her best. On completion of training, she passed her trade test with a 100% score the first time round, something that makes her smile. Within a month of graduating, Anelisa was employed at the Sorbet salon in Sea Point where she has recently celebrated her 1 year anniversary. 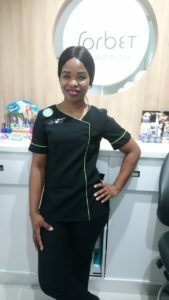 When asked what has been a highlight in the past year, Anelisa mentions the opportunity to be upskilled in further nail treatments and in makeup application. She would love to grow even further in the future and become a fully qualified therapist, offering all treatments including massages, waxing and facials. “I know this is something that I love, something that I want to do. This opportunity came into my life and I take it very seriously. You must know who you are, where you come from, what you want and how you are going to get there. You must always be yourself and tell yourself you can do this,” says Anelisa. SEW provides accredited skills training and support, through the Beauty Therapy Institute. Beneficiaries receive entry level manicure and pedicure training and additional soft skills training, with the intention of creating a job opportunity within the Sorbet Group on completion. Our focus is beauty education that translates into job creation. We invite our guests to Fund a Future with us, helping to change the face of unemployment in South Africa. With your contribution in-store, you’ll help a woman on a journey gain the upskilling she needs to become a qualified nail technician. Our goal is to empower 50 women by the end of 2019 into stable, full time employment. Look out for our SEW beaded bracelets in salons & other funding initiatives, affording guests the option of adding meaning to that feeling.